To paraphrase T. S. Elliot. Operation SMITHFIELD began "not with a whimper but a bang". 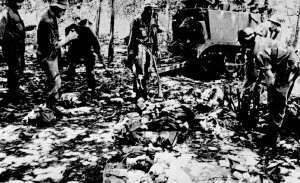 On the night of the 16th/I7th of August 1966, the Task Force Area was subjected to a heavy mortar and recoilless rifle attack. B Company was sent out early on the morning of the 17th to locate the enemy mortar base plate and recoilless rifle positions and destroy the Viet Cong attacking force. It accomplished this by midday on the 18th when D Company relieved it of its task. D Company had previously been warned for a three-day patrol as part of the Battalion patrol programme. Because of the enemy attack D Company's task was to take over the pursuit from B Company. 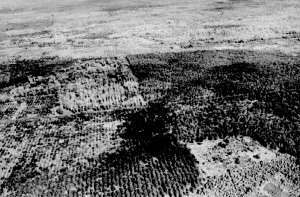 The Company began sweep operations in the rubber plantation to the north of Long Tan, a derelict village some four thousand metres to the east of the Task Force. At 1540 hours, 1 1 Platoon contacted 6 Viet Cong, who fled to the east. No sooner had the platoon moved forward again and searched a hut in the plantation than they came under heavy small arms fire from their front and left and right flanks. Artillery was called down, 10 Platoon moved towards 11 Platoon hooking in from the north, only to come under fire themselves. During this engagement, both the radios of 10 and 11 Platoons went out. 12 Platoon moved in from the south-east to try and extricate 11 Platoon, as 10 Platoon had to withdraw in the face of a superior assaulting force. 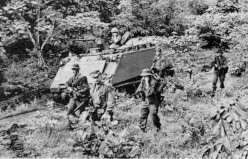 Under the constant firing of heavy machine guns and automatic fire 12 Platoon fought a rearguard action to cover the withdrawal of the survivors from 11 Platoon. By now the Company was at close grips with the enemy who had surrounded them on three sides. The beleagured Company received an ammunition resupply from a helicopter. The magnificent support by the field guns, and the aggressive fire by the Company stopped the many assaults by the enemy from over-running the position. This ordeal was pitched in its entirety under a blanket of mist and heavy monsoonal rain. B Company were ordered to return and assist D Company, and A Company, who had just returned to base from a three-day patrol, were also ordered to move in the armoured personnel carriers of 3 Troop, Ist APC Squadron, to reinforce D Company. The carriers moved with A Company and the Commanding Officer on board eastwards to the battle area, in teeming rain, fording the Suoi Da Bang river en route. The armour and the mounted infantry contacted at least three companies of the enemy forming up to assault the rear of D Company. Having routed the enemy, A Company arrived in D Company's area at about the same time as B Company. It was now 1910 hours. In the fading light D Company redeployed behind the screen provided by A, to attend to and extract the dead and the wounded by helicopter. 3 Troop assisted, using their lights to guide the "Choppers" in and marshall the aerial evacuation which was not completed until after midnight. On the morning of the 19th the Battalion moved forward into the battle area, finding two of the missing of 1 1 Platoon, Pte. B. C. Meller and Pte. J. B. Richmond, still alive. The battlefield was strewn with bodies of the enemy and their equipment. 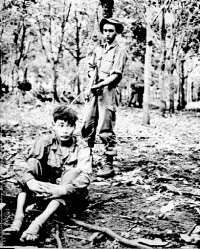 Three Viet Cong were captured including two North Vietnamese. 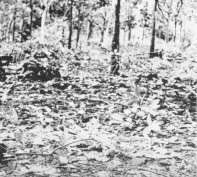 While D Company secured the area of the action, the Battalion with Carriers in support swept the general terrain finding trails and more enemy material. By the evening of the 21st August. 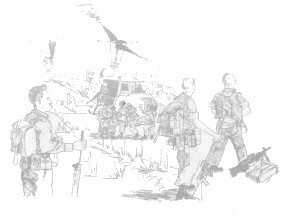 1966, the Battalion returned to base camp without any further contact with the Viet Cong, whom by this time had withdrawn well to the north-east. "The Prime Minister's Press Secretary has asked that the following message be passed to you. QUOTE. "Our forces in their latest engagement have acquitted themselves with skill effectiveness and high courage in the best Australian tradition. Please tell them that Australia is proud of them. I have publicly expressed my sympathy to the bereaved. My sympathy also goes to the wounded. I send them best wishes for a speedy -,recovery." "Hearty congratulations to the 6th Battalion Royal Australian Regiment and a company of the 5th Battalion RAR for their fine show in Operation SMITHFIELD. 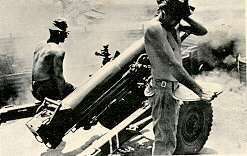 Your troops have won a most significant victory over the enemy and one of the most spectacular in Vietnam to date." "Please pass on to the 6th Battalion Royal Australian Regiment. My heartiest congratulations for the outstanding results attained during Operation SMITHFIELD. 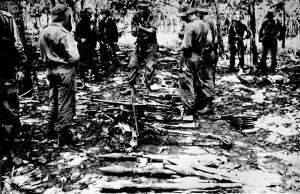 The large number of enemy killed as compared to the light casualties of the Australians is indicative of the professionalism of your Task Force. I especially want to congratulate D Company for its outstanding performance." SIGNED MAJ GENERAL SEAMAN, Commanding General 11 Field Force Victor. 1 killed in action from 3 Troop of the First APC Squadron. Ammunition. Some 12,000 rounds of various small arms, 300 grenades of different types, 100 rounds of mortar, recoilless rifle and rocket launcher ammunition.